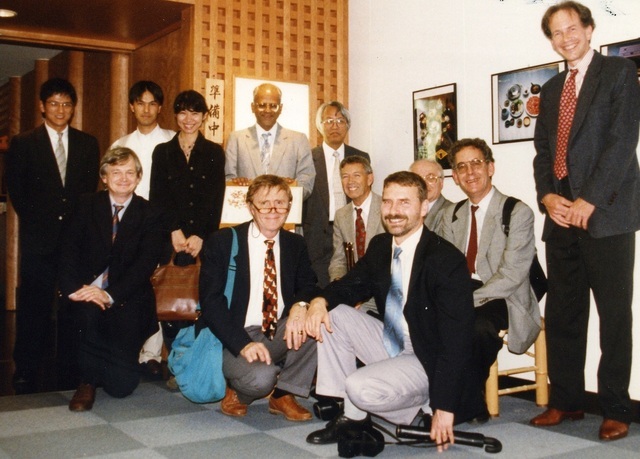 Participants at the International Crystallography Symposium at the Tokyo Institute of Technology, 1996. Participants at the International Crystallography Symposium at the Tokyo Institute of Technology, 1996. Standing: ?, ?, ?, Gautam Desiraju, Yuji Ohashi, Tom Koetzle; seated: Jim Trotter, Carl Krueger, Hans-Beat Buergi; Crouching: ?, Bill Duax, ?. Participants at the International Crystallography Symposium at the Tokyo Institute of Technology, 1996. 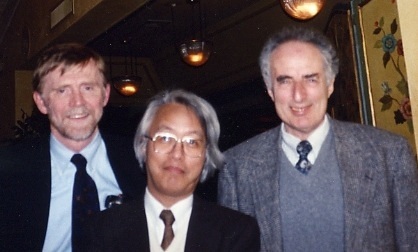 Bill Duax, Yuji Ohashi, Philip Coppens. Participants at the International Crystallography Symposium at the Tokyo Institute of Technology, 1996. 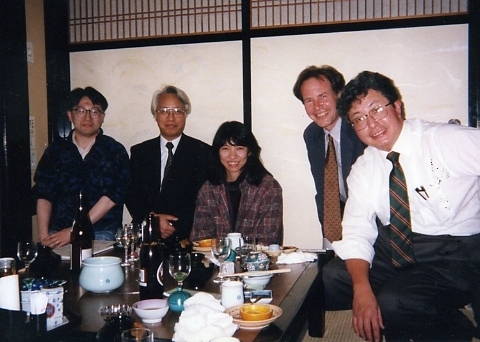 ?, Yuji Ohashi, ?, Tom Koetzle, ?. At the symposium of the Japanese Crystallographic Association commemorating the 100th anniversary of the discovery of X-rays held in Tokyo, 1996. 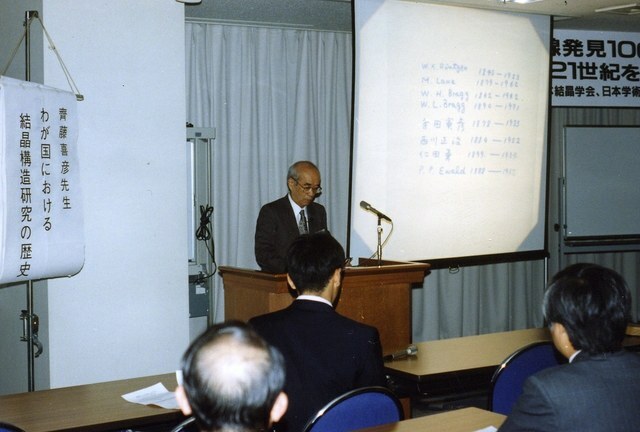 Giving the opening lecture at the symposium is Yoshihiko Saito (President of the CrSJ, 1974-75). At the Opening of the symposium of the Japanese Crystallographic Association commemorating the 100th anniversary of the discovery of X-rays held in Tokyo, 1996. At the symposium of the Japanese Crystallographic Association commemorating the 100th anniversary of the discovery of X-rays held in Tokyo, 1996. 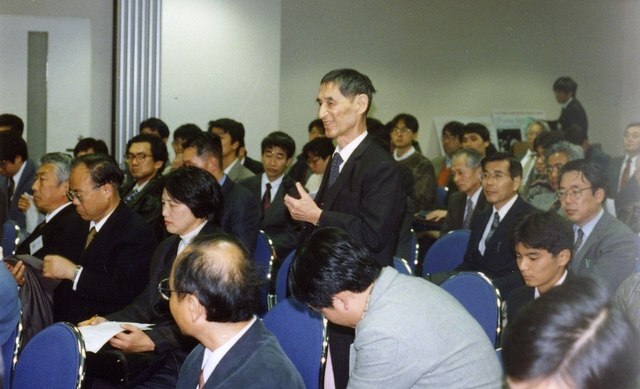 Asking a question is Kenji Osaki (President of the CrSJ in 1981). 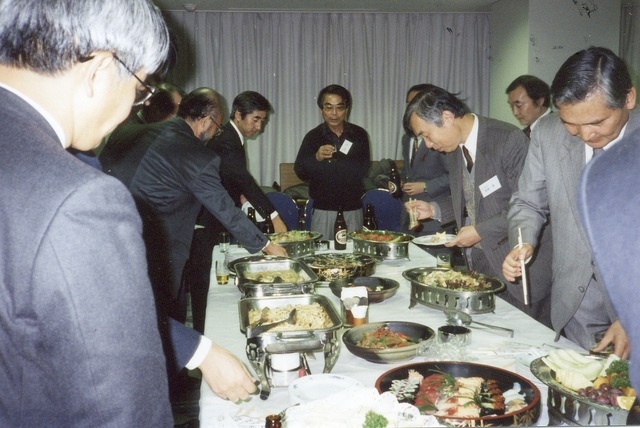 Lunch at the symposium of the Japanese Crystallographic Association commemorating the 100th anniversary of the discovery of X-rays held in Tokyo, 1996.